English Editors: Mike Richardson, Patrick Thorpe, et al. Translators: Michael Gombos, et al. Hyrule Historia is divided into four parts. The first part, titled “The Legend Begins: The World of Skyward Sword,” is a collection of artwork and design sketches from the 2011 Wii game Skyward Sword. The second part, “The History of Hyrule: A Chronology,” runs through the plot of every game in the Legend of Zelda series and demonstrates how they are all connected. The third part, “Creative Footprints: Documenting 25 Years of Artwork,” is a collection of art and design sketches from the entire series with a strong emphasis on Twilight Princess. The fourth part is a 34-page manga (of which ten pages are in gorgeous color) about the mythology of Skyward Sword by Akira Himekawa, a two-person team that has drawn the official manga adaptations of many games in the Legend of Zelda series. The “History of Hyrule” section, which is about seventy pages long, gives the book its name. When the series timeline from this section was released and translated into English, there was a bit of a kerfluffle in certain circles of video game fandom that had gradually been building their own theories and didn’t appreciate the retroactive continuity implied by the official version. 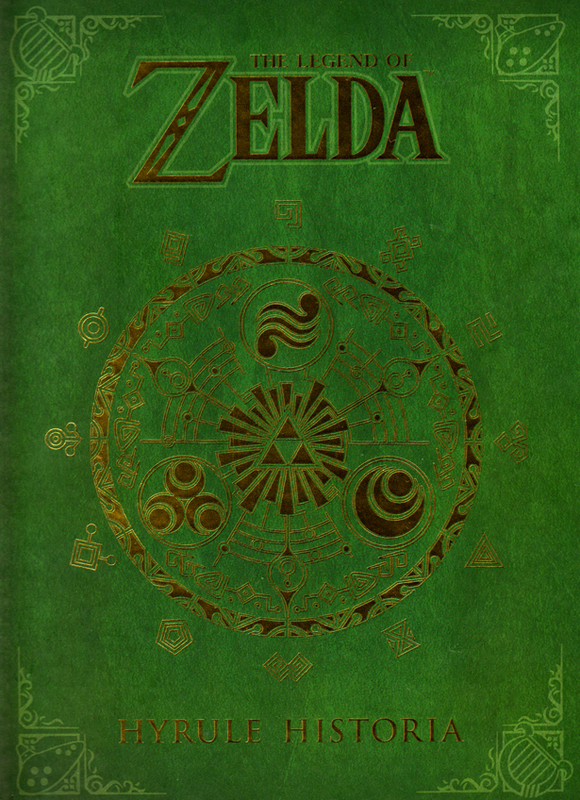 That being said, the timeline laid out by Hyrule Historia makes sense (inasmuch as anything involving time travel makes sense) and should be interesting to a fan of the series. The main bulk of the section, however, consists of condensed versions of the plot of each Legend of Zelda game. These plots are more or less what appears in the game manuals with very little extra or “never before revealed” information thrown in for flavor. Unfortunately, the basic “Link must collect items in order to earn the right to wield a special sword so that he can save Zelda after she is imprisoned by an evil entity” story begins to grow stale as it’s continually repeated across two dozen three-to-four-page increments. The main draw of Hyrule Historia is its artwork. In the first part of the book, which is filled with artistic development materials for Skyward Sword, the reader can witness the incredible attention to detail and world building that went into the game. These images are accompanied by myriad creator notes, which are often surprisingly humorous. Thankfully, unlike the Japanese original, in which many of these notes were handwritten in tiny characters, the typeface used to convey the creator notes in translation is large enough to read easily. The artwork on display for the other games in the Legend of Zelda series in the “Creative Footprints” section is also quite interesting. There are all sorts of designs for the main characters, secondary characters, enemies, weapons, and items. 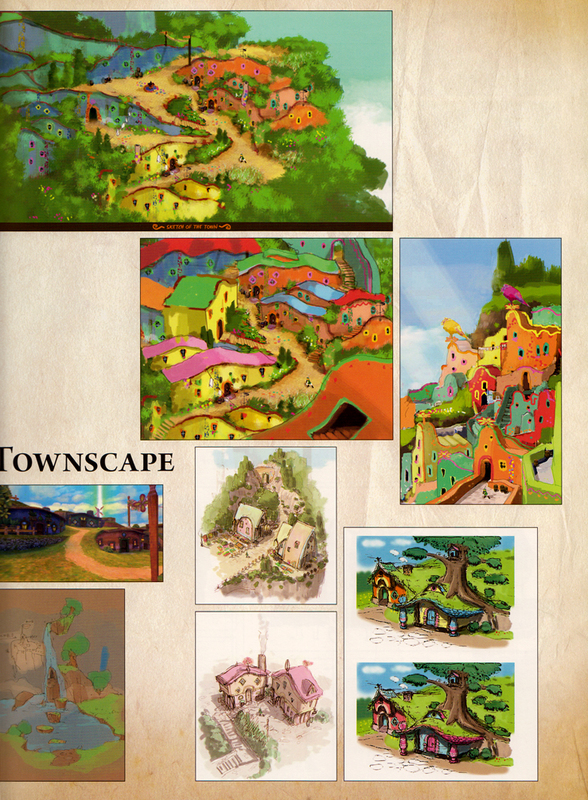 There are also rough drafts of dungeon maps, enemy treasure drop charts, and other developmental materials, such as different drafts of promotional concept art. Some of this artwork shows exactly how enemy wings, tails, and teeth work, with suggestions for how different designs accommodate different movements. There are fewer written notes in this section than in the first section on Skyward Sword, but there is still enough text to draw the reader into the image details. I particularly enjoyed the architecture and island sketches from The Wind Waker, as well as the full designs of the stained glass patterns that appear in the game’s building interiors. 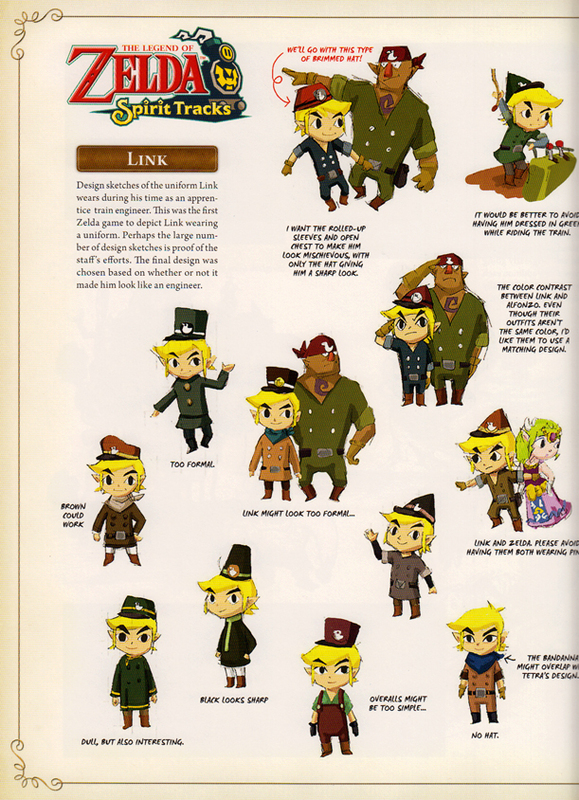 I also enjoyed getting a sense of the evolution of the Link character in each Legend of Zelda game, as different designs show him as younger or older, or more or less serious, or wearing entirely different sets of clothing and equipment. You can’t really see this in the scans I made, but the image quality in Hyrule Historia is impeccable; the book is something that you need to hold in your hands in order to fully appreciate. The emphasis of Hyrule Historia is obviously on Skyward Sword, but all of the Legend of Zelda games get multiple pages of attention. A great deal of the book’s text feels like it’s selling the series, especially in the “History of Hyrule” section, and it can sometimes be a chore to read. Still, artists and art appreciators will love the incredible array of sharp and colorful images, and the physical book itself is sturdy enough to handle all manner of wear and tear that may occur over the course of reference use. Dark Horse did an excellent job with this gorgeous book. If you’ve been on the fence about buying a copy, Hyrule Historia is absolutely worth your time and money.